"We have expanded our non-Toyota business quite significantly, and there is more to come. We sowed the seeds, and now we will grow." With an estimated $6.7 billion in worldwide parts sales to automakers in fiscal 2014 and nearly 35,000 employees worldwide, Toyoda Gosei Co. would appear to be the very definition of a global supplier. But President Tadashi Arashima, 65, does not see it that way. Although Toyoda Gosei ranks No. 37 on the Automotive News list of the top 100 global suppliers, 65 percent of its revenue comes from Toyota Motor Corp.
Three years ago, the company announced plans to reduce its dependence on Toyota and sell more components to other automakers. 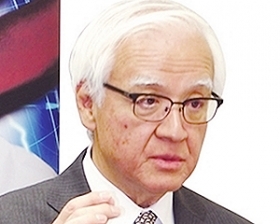 During an interview with Special Correspondent David Sedgwick, Arashima critiqued his company's progress. Q: In 2012, Toyoda Gosei formed a plan to become a global supplier with significant sales to non-Toyota customers. How's it going? A: I think we're on track. We haven't really seen much visible change in our sales figures yet. Even if we get a contract, it takes three, four or five years for a new car to come out. But we have expanded our non-Toyota business quite significantly, and there is more to come. We sowed the seeds, and now we will grow. So Toyoda Gosei is getting new contracts? Exactly. We are now in operation in Brazil, and we have built two new plants in Mexico. And we are constructing a new facility in India right now. So we have a number of new projects outside Japan. Toyota represents 65 percent of Toyoda Gosei's sales. Does Toyoda Gosei still aim to reduce that to 50 percent by 2020? Yes, but this is still a stretch, I think. And will non-Japanese customers generate 30 percent of Toyoda Gosei's sales, up from 10 percent? That is also a stretch. So it's a slow process, and the competition isn't giving anything away? A year ago, Toyoda Gosei acquired Meteor, a German supplier of rubber components. What did that achieve? This gave us access to Daimler, BMW and Audi. Is Toyoda Gosei still looking to make acquisitions? I don't rule out future opportunities, but at this moment we have no intention to [buy] additional businesses. Does Toyoda Gosei still aim to increase North American sales to $1.8 billion by 2018? Yes, and I think we are very close to it. Does the company want to expand its product lineup? We are developing LED headlamps. We'd like to be in that area. Are LED lights in production? Yes, we are producing LEDs [for interior lighting]. Toyota has encouraged its suppliers to produce as many components in North America as possible. Is Toyoda Gosei transferring any production from Japan to North America? Most of our products are very bulky, so we have to be close to our customers. We are not affected so much by the yen-dollar rate because we already produce so much locally. We have to be close to our customers regardless of the exchange rate. Do North American factories produce most of Toyoda Gosei's components sold in North America? Yes, except for LEDs. We make almost all of them in Japan, plus some in Taiwan. Toyoda Gosei has three plants in Mexico, and a fourth will launch production next year. Why is Mexico a good location? We have to be very close to our customers. Irapuato, our fourth Mexican plant, was built for non-Toyota customers. At the time, Toyota hadn't decided to go to Mexico. We are excited that [Toyota's new assembly plant] will be very near our factory. How close to capacity are Toyoda Gosei's North American plants? Can Toyoda Gosei meet its North American customers' production quotas? Yes, we have some overtime, but we are very comfortable. It's under control. If the customer works six days, we work six days. Is Toyoda Gosei also expanding capacity in the United States? Yes. We have a very big factory in Missouri, which makes inflators. We are building a new inflator factory, and we are adding capacity for chrome plating. Does Toyoda Gosei make replacement inflators for Takata's customers? No. There are some calls [from Takata customers], of course, but we are quite busy at this moment. The airbag market is growing in China and India. And in Europe, Japan and the United States, the number of airbags [per vehicle] is still growing. What products have the most growth potential? I would say safety systems, and also chrome-plated interior and exterior parts. We are seeing huge demand from our customers for high-quality decorative trim. I see a lot of opportunity in this area. Johnson Controls, Magna, Visteon and Lear sold their interior trim units because profits were thin. Is this a good segment for you? For plastic components, there are quite a few suppliers wherever you go, small ones and big ones. Yes, the industry is quite competitive. But for certain high-end products, there is still a good opportunity to make a reasonable profit. We have very sophisticated technology for interior storage devices that can open this way or that way. We are very good at functional components, so we are attracting that business.